EDGA golfer Monique Kalkman talks with Tony Bennett about how cancer as a teenager left her in a wheelchair facing huge life challenges. Rather than ending her sporting career, with the support of her family she battled and then thrived to become World No: 1 in tennis for six years, winning Paralympic gold medals. In the last decade she has become a highly rated golfer and is now helping to open doors for others with a disability to enjoy competitive golf. A remarkable story, and a remarkable person. As an athlete, Monique Kalkman has won some major battles. Perhaps the first was an intensely satisfying battle against herself, to hone early tennis skills by pounding a tennis ball against the bricks of the garden wall. Then in 1979, aged 14, when hopes and dreams were blossoming, she had to endure a traumatic fight against devastating illness that left her in a wheelchair. That she came through this with the help of her always positive, warm-hearted family was remarkable in itself. Then there was the setting out on a journey, a leap of faith, which led to her winning Paralympic gold medals in first table tennis aged just 19 and later, gold medals in tennis at successive Paralympics; earning the crown of World No:1 for six years. The best in the world! Perhaps the most crucial victory of all however was a mental battle rather than a physical one. It was back then as that 14 year-old, overcoming the fear and pressure in rehabilitation to remain resolutely in charge of her own destiny; refusing to be defined by her disability, or to be seen as another person to process by well-meaning ‘white coats’ in a gloomy rehabilitation centre. Instead, Monique and her family concentrated on the ability rather than the disability and won through. Fast forward nearly 40 years and last year she received a tremendous reward for what one writer has called a career made up of “grace and grit”. One of the sport’s absolute legends, Stan Smith (former US Open and Wimbledon Champion), picked up the telephone to inform Monique that she was being considered for that club of the greats, the International Tennis Hall of Fame. And as a world champion athlete, after retiring from tennis in 1997, it would take another leap of faith 10 years later to put her neck on the block, to take seriously a new sport in golf; to trust a ‘paragolfer’ machine, learn to swing a golf club one-handed at a small ball, and find a way to convert that famous hand-eye skill from the racquet to produce exciting results on the fairway. While sports bodies talk up ‘resilience’, ‘determination’, ‘focus’, ‘respect’, ‘sportsmanship’ (Monique possesses as many of these major qualities as golf clubs in her golf bag) what comes across plainly in the audio interview for ‘EDGA Profiles supported by PING’ on this page is her genuine love of learning coupled with a strong emotional intelligence that allows Monique to look straight ahead at the world while drinking from a glass that is distinctly half-full. Tennis was always going to be a big deal after five year-old Monique van den Bosch discovered her Mum’s wooden tennis racquet in the attic. At age 14, Monique noticed that her weight started to drop and she began to find another beloved sport, hockey, much harder physically. Her coach offered a veiled criticism of her work-rate in an end of season letter which stunned and upset her. Monique started to visit the local doctor but symptoms of exhaustion were diagnosed as the flu. But she wasn’t getting better and was sent to the hospital for tests. Fluid between the lungs and muscle was taken away but one of the doctors remained concerned and asked her to return in 10 days. The ambulance came. The tumour against her spine had grown, it was removed but soon after there was further bad news. Monique would be in hospital for six months. “The glass is half-full” was a slogan of Monique’s parents Jan and Riet; the couple were champion brewers by trade in the Netherlands so it was entirely appropriate. With four sisters and two brothers there was not only a lot of love in that hospital room (and you can add in all the members of her hockey team who would visit to cheer her up), there was also determination and shrewd decision making. Her parents were shocked by the soul-destroying “vibe” of the rehabilitation facilities and decided to take Monique away from dour rooms surrounded by white-coated medical staff and set her up at home in a supportive atmosphere where they could “try to see the ability rather than the disability”. “These types of decisions were really instrumental in my rehabilitation and for me as a person overall,” says Monique. Only a year later Monique was watching the Paralympics in Arnhem on TV and thinking about what sport she could possibly play. Tennis wasn’t an option at first but table tennis was. She found her way into the sport, and soon found a way to start winning in style, blowing away the competition. Paralympics, 1984, gold in her category for table tennis at the age of 19. What did that first win feel like? When Monique learned about wheelchair tennis there were many adjustments to be made in terms of fitness, conditioning, technique and strategy from her previous experience of the sport but she soon felt at home again. For this fast-learner, her skill-level rocketed as she learned to shorten backswings, use more top-spin and create wider angles to attack the mobility limitation of the athlete in the wheelchair on the other side of the net. IWTF World Champion 1992, 1993, 1994 and 1995. Monique has won the following tournaments: four US Opens, six British Opens, five French Opens, two Australians and also wins in Switzerland, Holland, Japan, Belgium, Austria and the US. The list should also include eight team appearances in eight World Cups for the Netherlands. Many of her wins were enjoyed court-side by her biggest fan, the family dog, a Boxer by the name of Murphy. Winning gold in Barcelona in 1992 with the help of her inspirational coach Marc Kalkman (who would later become her husband), came in a spell when Monique reigned for six years as the undisputed number one in the world. The very best there was. But after a decade of achievement, Monique was finding the intense level of competition and practice all quite demanding – the international travel, the living out of a suitcase. It was time to retire and also start a family. 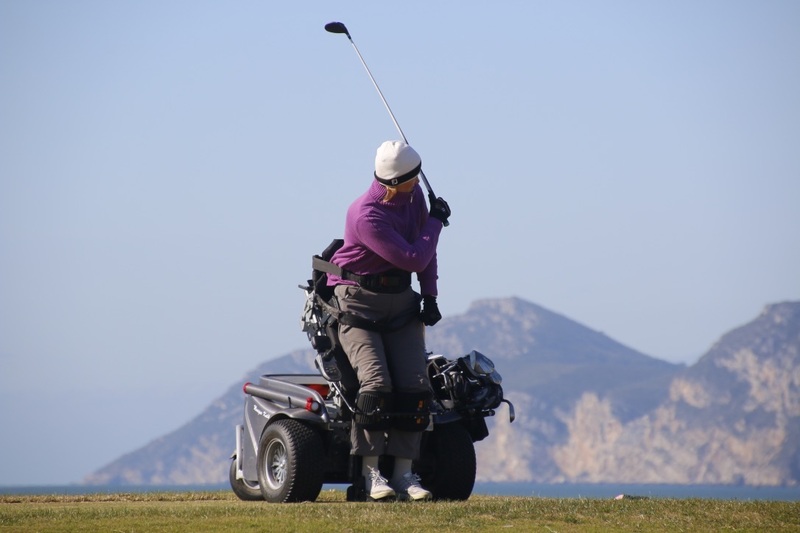 After an operation and issues with neck dystonia, Monique decided she needed to find a new sport to help her, and the golf started simply as good therapy. Ten years earlier she had taken a buggy ride on a golf course while at a tennis camp and was “amazed by the beauty of the nature” on a golf course, enjoying “the serenity and elegance of the sport”. But at that time she didn’t know of the paragolfer chairs that can help paraplegic players. On a trip to the driving range and then enjoying golf courses on holiday in Ireland with husband Marc, she started to see that this could be a sport for her. Monique found that using a paragolfer was ideal for her fitness and for her neck injury, as she could play from a standing position. Her patience in gradually developing her golf game with her coach seems remarkable: “It’s like building a house,” she’ll say. At first she tried to swing instinctively with two arms against the coaching advice but soon found that a paragolfer suits a one-handed swing for mobility and rhythm, and today she belts a golf ball with her right arm with the same conviction as she used to belt that tennis ball against the wall. Watching the likes of two other wheelchair golfers Anthony Netto and Sebas Lorente and the way they approached the swing also helped, and her willingness to put in the hard yards, spending hours on the range, made Monique little by little the accomplished player she is today. Now, after pushing a little hard two years ago and injuring herself, Monique is working on a balance for her golfing ambitions. In fact, one ‘pipe dream’ in terms of golfing success has recently been replaced by a more pragmatic one for Monique. Her own Foundation ‘Going for Golf’ has been supporting people to experience a quicker and better rehabilitation by enjoying golf. 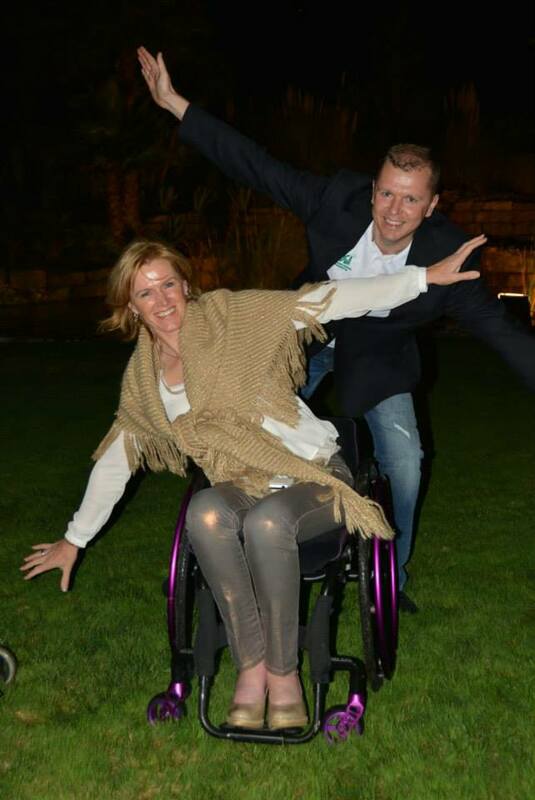 This Foundation is soon to be submerged into ‘fonds Golf’ of the Dutch Disabled Sports Foundation, which supports those with disability in all sports to reach their potential. Monique is pleased with this development because of the organisation’s reach, its power to attract sponsors and its strong national standing (she also remains close to tennis and is an ambassador for the International Tennis Federation, and also an ambassador for the Global Challenge sports initiative). Through her experience and contacts Monique knows that nothing is straightforward when growing the sport of golf. 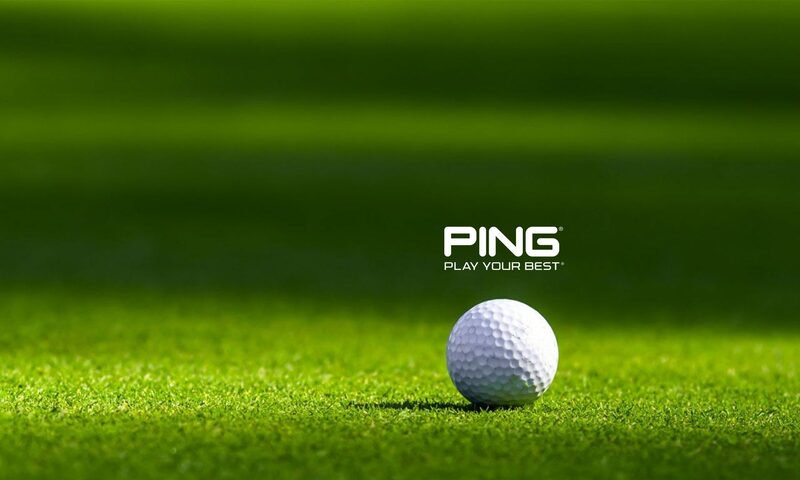 She believes that though golf offers all new players some early successes in terms of putting, chipping and enjoying a few holes, competitive golf on tougher 18-hole courses, in sometimes bad weather, can be a huge challenge for players with a disability and those with paragolfers, as can be the travel involved. Monique is also concerned that not enough women with disability are coming into the game and she wants to see this rectified, though there aren’t magic solutions. When Monique was a young girl she belted that tennis ball against the wall. She would later be dispatching opponents watched by Murphy the Boxer dog. All those memories of childhood, her illness and rehabilitation and all the work to rise up to be number one in the world, would come back to her when she was invited to attend the Australian Open in 2017 as an inductee to the International Tennis Hall of Fame. 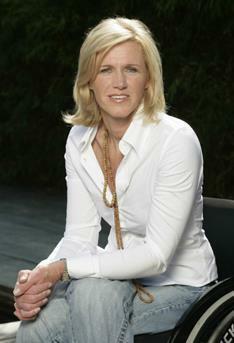 In Melbourne, she found herself on the same court with the likes of McEnroe, Becker, Laver, Navratilova, Hingis. It is a measure of Monique Kalkman that if called upon, Chris Evert would no doubt find it a privilege to honour a fellow world-beater in this way. 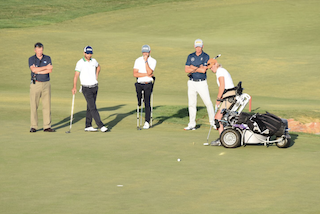 Watch the EDGA demonstration team of six players teamed up with European Tour golfers to play the EDGA Greensomes Challenge in front of the crowds and television cameras at the 2017 Portugal Masters. 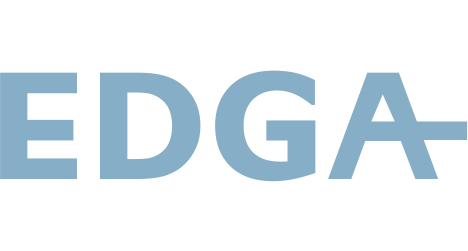 The EDGA team comprising of Mike Gays, Juan Postigo Arce, Monique Kalkman, Pedro Sottomayor, Aurélien Lacour and Rasmus Lot all played exeptionally well with Monique tapping in the winning put.